Starting/Cycle Service Commercial AGM batteries have the power and durability to handle anything from complex on-board electronics and plug-in devices to dozens of extra lights. They are also made to deliver the quick, high-powered current that will bring even the toughest engines to life. 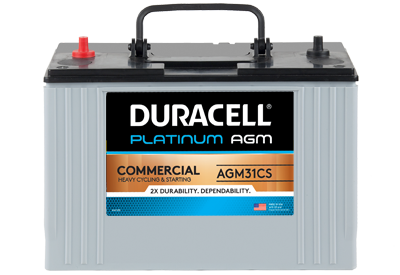 Deep Cycle/Starting Service Commercial AGM premium batteries are made with plenty of power and a specially reinforced internal construction to withstand the multiple charging and recharging service of demanding battery powered systems (such as HVAC and APU units). For commercial vehicles with heavy power demands, these batteries provide one of the industry’s best options for integrating deep cycle and moderate starting power performance. 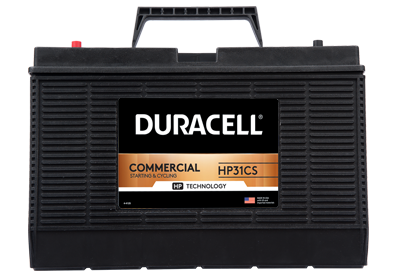 Duracell Commercial batteries have the high cranking performance that brings even the toughest engines to life. 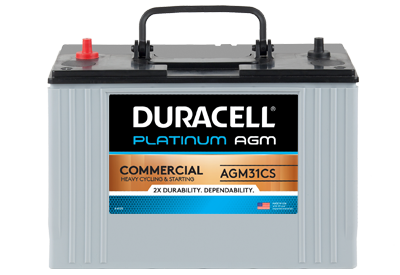 There are also cycle service batteries to not only start the engine but to also handle the increasing need for more reserve and accessory power. A durability-enhanced construction and other special features ensure trusted performance and extend service life.